Size of Male: 20-21 lbs., 15 in. Size of Female: 20-21 lbs., 15 in. Friendly, outgoing and playful, the Welsh Terrier may be the oldest existing dog breed in Britain. They are intelligent and they have a strong desire to please. They’re usually good with children and they make a very good dog for a young, active family. These dogs are medium-sized and they have a coarse, wire-textured coat. They are sturdy and compact. 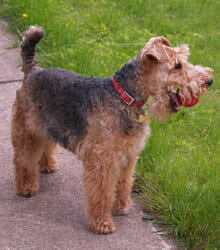 The Welsh Terrier originated in Wales where he was used to hunt fox, badger and otters. It’s believed that this breed may be the same dog as the Black-and-Tan Wire Haired Terrier, which was the ancestor of many other terrier breeds, or the Old English Terrier. The Welsh was often used as a sporting breed because of their gameness of many different animals. The breed was late to the show ring because they were actively being worked in the field. They have not changed much since they were used as working dogs. This medium sized terrier dog breed has a normal terrier temperament. They are happy, lively and energetic. They can have a terrier attitude at times. They like a challenge and it’s important to keep them occupied or they can get into trouble. They may chase things (children, other pets) at times so they should be taught to play gently. Living Environment – Because of their medium size, this dog breed can adapt to living in most places. They can make a good apartment dog if you are willing to see that they get plenty of daily exercise. However, they do very well in a larger home. Grooming – The Welsh has a coarse, wire-haired coat that needs to be plucked several times per year. You can learn to do this yourself or go to a groomer who knows how to do it. You should comb and brush your dog’s face several times per week to keep the hair looking tidy. Diet & Exercise – This terrier dog breed has normal dietary requirements. However, they are a very active dog and they do need to have plenty of daily exercise. They can become mischievous indoors if they don’t get enough exercise. They enjoy swimming and digging. Health – The Welsh is said to be generally healthy but they may be predisposed to glaucoma. Other dog eye problems have been found in the breed. The breed may also suffer from Addison’s Disease, Cushing’s Disease, epilepsy, canine hypothyroidism, luxating patella and elbow dysplasia. You should always talk to a breeder about health issues before getting a puppy. In the dog training department, the Welsh Terrier is an intelligent dog but it’s said that they can be hard to house train. Many of the terrier breeds are intelligent but they do not always do well at formal obedience. They were bred to be independent thinkers since they had to hunt and make decisions for themselves when going after prey. They can be trained but you may need to be patient and find ways to motivate your dog and keep his attention.